MAY I tell you something about Aria? From Goodreads: Since she’d been on the outside, she’d survived an Aether storm, she’d had a knife held to her throat, and she’d seen men murdered. This was worse. Exiled from her home, the enclosed city of Reverie, Aria knows her chances of surviving in the outer wasteland – known as The Death Shop – are slim. If the cannibals don’t get her, the violent, electrified energy storms will. She’s been taught that the very air she breathes can kill her. Then Aria meets an Outsider named Perry. He’s wild – a savage – and her only hope of staying alive. A hunter for his tribe in a merciless landscape, Perry views Aria as sheltered and fragile – everything he would expect from a Dweller. But he needs Aria’s help too; she alone holds the key to his redemption. Opposites in nearly every way, Aria and Perry must accept each other to survive. Their unlikely alliance forges a bond that will determine the fate of all who live under the never sky. Let me be honest about Aria… I did not find her initially likable. When we meet her at the novel’s beginning, she’s naive and pampered and pretty helpless — although through no fault of her own. Aria is Aria because of her environment, the Pod she grew up in, confined and safe and clueless, and she appears to embrace that lifestyle. That said, there’s much more to Aria than meets the eye, and after life throws a few major curve balls her way, she starts to become a protagonist readers can believe in. While Aria at first resists her new world and all its challenges, it’s not long before she takes initiative. She learns to feed herself and defend herself and, in the process, to be herself. She has a way of dealing with Peregrine, her “ally,” that I found very intriguing. Though they’re opposites in many ways, in several instances Aria seems to know intuitively exactly what Perry needs. Their relationship was balanced and grew out of respect, which made its progression a satisfying climb. The more Aria accepted her new world, and Perry, the more I grew to love her, until I found myself invested, rooting for her and thinking about her plight even when I wasn’t actively reading. Aria’s steep, authentic arc transformed her from a character I felt eh about, into a character I adored, a character whose story I can’t wait to continue reading. 1. Word-building – Thorough, creative, inimitable. There are so many thoughtful, unique details in Aria and Perry’s world. 3. Perry – Tortured, tough but secretly sensitive, courageous, intelligent and loyal. Oh, and he makes leather pants look good. 4. Prose – Straight-forward, yet elegant and descriptive. I found myself rereading passages because they were so beautiful. 5. The Spontaneous Kiss — Yes, it’s a thing, and it’s so sweet! Please, please, PLEASE check out Under the Never Sky if you haven’t already! Have you read Under the Never Sky? Thoughts? MAY I ask something about you? MAY I share something funny? 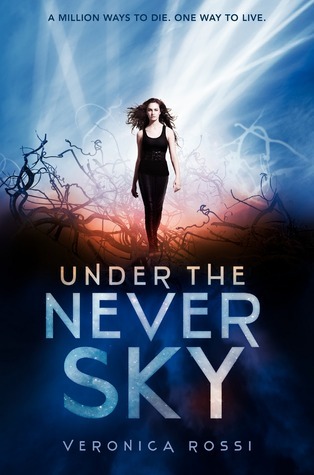 Aahhhh Katy 😀 I was telling myself I would wait to pick up this one because I didn’t want to wait for the sequel…but your review is changing my mind!As soon as I’m done with INSURGENT way), I will need to put UNDER THE NEVER SKY higher on my TBR 😀 Thanks for sharing! I have read it–and I loved it. I thought the world building was absolutely phenomenal! I agree! There was so much creativity and detail, and everything came full circle and tied together. I love that! Yep, Peregrine like the hawk. It makes sense when you read the book. 🙂 I just got BITTERBLUE yesterday, and I can’t wait to reading it. I’m currently working on TEN, then comes INSURGENT, and then BITTERBLUE… Yay! I’ve been eyeing this one at the book store. Definitely picking it up! Great review, Katy! Thanks, lady! It’s a fantastic read! This one sounds good–I’m always interested in reading books with initially unlikable protagonists. It’s so hard for a writer to do that well, but it’s so satisfying when you (as a reader) grow to love a character! It was incredibly satisfying! I went from kind of rolling my eyes, to cheering and desperately wanting to know what happens next for Aria. Love when an author is able to make that happen! Oh thanks for sharing! I’ll add to my TBR list! Hope you love it, Liz! Sounds great! I’ll add this to my list. Hope you enjoy it, Dana! I’ve heard so many wonderful things about this book, and your review has convinced me I NEED to read it! Thank you for so much great information about the main character, and what a fun way to tie it in to the Blog Me MAYbe prompt 🙂 Love it! This is one I might have to reread as well… I didn’t expect to love it so much because I keep thinking fresh dystopian can’t be done. Yet, I’m continuously proven wrong!